The Ford government withdrew Schedule 10 of Bill 66 yesterday, which still leaves much of this omnibus bill on the order paper. Each schedule – there are 12 – targets a different ministry. It’s the section dealing with land-use planning under the municipal affairs and housing ministry that is gone. The news was tweeted out, as is the custom in this Trump era, by Municipal Affairs Minister Steve Clark. “The use of this tool would never be approved at the expense of the Greenbelt or other provincial interests like water quality or public health and safety,” he twittered by way of introduction. That is precisely the kind of black-is-white speak we have heard from our Progressive Conservative MPPs. Schedule 10 specifically listed the Greenbelt Act and the Clean Water Act as among the laws whose restrictions on development need not apply. So of course projects approved under Schedule 10 could encroach on the Greenbelt! and set aside the public health and safety provisions of the Clean Water Act! We are left to speculate. Why, if Clark considered Schedule 10 of Bill 66 to be so safe and protective, would he withdraw it? Politics, of course. Schedule 10 was in fact so profoundly wrong that a huge wave of opposition threatened to engulf the government. MPPs were feeling the heat, municipal leaders were taking a stand, and groups ranging from Environmental Defence to the Ontario Federation of Agriculture to the Ontario Professional Planners’ Institute were weighing in. At Springwater Township’s council meeting last night, I presented AWARE Simcoe’s opposition to Schedule 10. With that part of Bill 66 withdrawn, it might have seemed superfluous – but similar legislation looms and this debate wasn’t about legislative detail, it was about basic principles and we need to understand what they are and why they matter. The most basic principle of all is democracy. A political system that’s messy and challenging, but – we as a society have decided – better than others. So I pointed out to council that Schedule 10 failed on every conceivable level – no public notice or information to the public, no public meeting, and no appeal once a secretly passed bylaw is approved by the minister. I illustrated with a photo of the rally against Site 41 in Perkinsfield in 2009 – 2,000 people turned out. This is what happens when there’s deep disconnect between what government does and what citizens want, I told them. I talked about planning principles. The reason for all this “red tape,” as the Tories call it, is to set out a level playing field in which all can participate and be dealt with fairly. Whether the rules come in the form of legislation, treaties, or non-conforming uses, the purpose is for us to live in harmony, with each other and with natural forces. On to the Clean Water Act. What I really wanted councillors to understand is that the CWA is not about the environment. It’s about us, about our public health. And I went into the history of the act, arising from the Walkerton tragedy. Pre-2000, when it came to water, there was weak legislation and poor oversight from the province. Brockton councillors didn’t know that. Alone among them, Councillor Mary Robinson Ramsay had taken note of the alarming reports from an environment ministry inspector and tried to get other members of council to take action. She was ignored. And, I wanted to stress, the Clean Water Act only applies to municipal drinking water systems. We have a gap in our protections, with many private wells and vulnerable aquifers left with no protection from contamination or over-extraction. That gap is why AWARE Simcoe and other groups advocate for Greenbelt extension into Simcoe County. I’m attaching the full submissions – from the OFA, the Ontario Farmland Trust, and the Christian Farmers Federation – to the end of this blog. Then I spoke of the Hine’s Emerald Dragonfly. 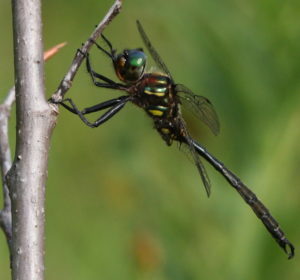 The Minesing Wetlands is the only place left in Canada where this beautiful, globally endangered dragonfly makes its home, with a few isolated populations surviving in the United States. It requires shallow, undisturbed, springwater-fed marshes and sedge fens surrounded by forest and meadows.These are features of the Minesing Wetlands that are presently being degraded by human activities, including development in a dozen settlement areas including Barrie, Midhurst, Everett, Angus, Snow Valley. I’m attaching a Nottawasaga Valley Conservation Authority report on an aspect of this degradation at the end of this blog. It dates back to 2014. Today, I checked for more up-to-date information. Unfortunately the Nottawasaga Valley watershed report card is even older, 2013, as is the case with 10 out of 13 report cards posted online. These are supposed to be updated every four years. I expressed concern to NVCA CAO Doug Hevenor, who advised of hitches in the process but assured that the NVCA has every intention to continue to monitor and update the watershed report cards in the future. I concluded my presentation to Springwater with the thought that the Hine’s Emerald is a symbol of why no development should be allowed to by-pass regulation that protects farmland, water and natural heritage, which are all under threat. I had two questions from councillors. Jack Hanna asked if our group had reached out to MPP Doug Downey. I said the Simcoe County Greenbelt Coalition, of which AWARE Simcoe is a member, had had a meeting with the Barrie—Springwater—Oro-Medonte MPP. Turns out I was wrong. The SCGC met with MPPs Andrea Khanjin (Barrie—Innisfil), Caroline Mulroney (York—Simcoe), and Jill Dunlop (Simcoe North) to explain our concerns about Bill 66. Despite repeated approaches, Downey’s door has remained closed. And Perry Ritchie expounded aggressively on the evils of the now-repealed Green Energy Act. “Where were you?” he asked me, when that act was brought in. We were fighting it, I told him. AWARE Simcoe was founded in 2010. Opposition to the 2009 Green Energy Act was a major focus of our activity in the early years. Example. We like green energy, we just didn’t want solar farms consuming good agricultural land and we didn’t want projects to bypass public input and municipal approval. I don’t actually remember Perry as being on the front lines of that battle. He now seems to feel that the errors of the Green Energy Act justify further initiatives to disempower communities. Withdrawal of Schedule 10 is a victory. It had felt as if this terribly ill-conceived legislation was going to be rammed through. We stopped it! Let’s enjoy that, for a day. Many battles lie ahead, to preserve local democracy, keep sprawl from consuming our countryside and ensure that the Hine’s Emerald Dragonfly and other endangered species continue to grace this Earth. This, for instance: Growth Plan controls (deadline for comment Feb. 28). And this: Made-in-Ontario Environment Plan (deadline Jan. 28). And this: Endangered Species Act (deadline March 4). Well done Kate. Thank you.